**Contains 'Hidden Yellow' pigment for superior light blockage in Bahama Blue & Midnight Black models. 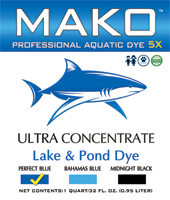 MAKO™ rapidly spreads through your water to create a stunning natural effect. Formulated using only the highest quality deep dyes, MAKO™ guarantees a deeper, richer appearance. Perfect for lakes, ponds, ornamental water features, fish hatcheries, irrigation & runoff canals, drainage ditches, aquaculture and other contained (or very low outflow) bodies of water.